Use Quake-Live to read pulse of our planet earth. Be the first to know when and where Earthquakes are happening. Even know about major Earthquakes before you see it on your TV screens. Our promise: Quake-Live is as easy to use as stethoscope used by doctors. No extra jumbo-mambo clutter to fill the space on screen. Get In- Get Out- Save Time! 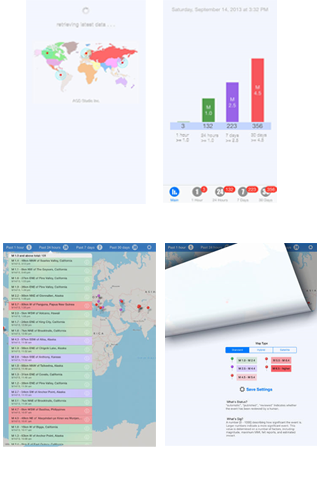 Quake-Live places the latest Earthquake data under your fingertips. - Past 1 hour: Report of past 1 hour Earthquakes. - Past 24 hours: Report of past 24 hours Earthquakes. - Past 7 days: Report of past 7 days Earthquakes. - Past 30 days: Report of past 30 days Earthquakes. - Color-coded table cells for easily differentiating between scales of Earthquakes. - Ability to pinpoint a particular Earthquake. - Ability to change map type. - In landscape mode map occupies the entire screen for better view of the whole world map. - Each pin displays Earthquake magnitude, location, significance, status, and date/time.